The internet is rich with data, and much of that data seems to exist only on web pages, which -- for some crazy reason -- are designed for humans to read. When students/researchers want to apply data science techniques to analyze collect and analyze that data, they often turn to "data scraping." What is "data scraping?" I define it as using a program to fetch the contents of a web page, sift through its contents with data parsing functions, and save its information into data fields with a structure that facilitates analysis. Python and R users have their favorite packages that they use for scraping data from the web. New SAS users often ask whether there are similar packages available in the SAS language, perhaps not realizing that Base SAS is already well suited to this task -- no special bundles necessary. Process the source content of the page -- usually HTML source code -- and parse/save the data fields you need. If necessary, repeat for subsequent pages. This applies to those web sites that serve up lots of information in paginated form, and you want to collect all available pages of data. Process/parse the web page contents DATA step, with parsing functions such as FIND, SCAN, and regular expressions via PRXMATCH. 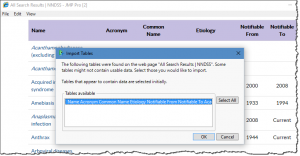 Use SAS informats to convert text to native data types. Repeat across subsequent pages SAS macro language (%DO %UNTIL processing) or DATA step with CALL EXECUTE to generate multiple iterations of the fetch/parse steps. In the remainder of this article, I'll dive deeper into the details of each step. As an example, I'll present a real question that a SAS user asked about scraping data from the Center for Disease Control (CDC) web site. I'm writing this article at the end of 2017, and at this point in our digital evolution, web scraping seems like a quaint pastime. Yes, there are still some cases for it, which is why I'm presenting this article. But if you find information that looks like data on a web page, then there probably is a real data source behind it. And with the movement toward open data (especially in government) and data-driven APIs (in social media and commercial sites) -- there is probably a way for you to get to that data source directly. In my example page for this post, the source page is hosted by CDC.gov, a government agency whose mandate is to share information with other public and private entities. As one expert pointed out, the CDC shares a ton of data at its dedicated data.cdc.gov site. Does this include the specific table the user wanted? Maybe -- I didn't spend a lot of time looking for it. However, even if the answer is No -- it's a simple process to ask for it. Remember that web sites are run by people, and usually these people are keen to share their information. You can save effort and achieve a more reliable result if you can get the official data source. Web scraping is lossy, fragile process. The information on the web page does not include data types, lengths, or constraints metadata. And one tweak to the presentation of the web page can break any automated scraping process. If you have no other alternative and you're willing to accept these limitations, let's proceed to Step 1. FILENAME URL, which assigns a SAS fileref to the web page content. You can then use INFILE and INPUT to read that file from a DATA step. PROC HTTP, which requires a few more lines of code to get and store the web page content in a single SAS procedure step. I prefer PROC HTTP, and here's why. First, as a separate explicit step it's easier to run just once and then work with the file result over the remainder of your program. You're guaranteed to fetch the file just once. Though a bit more code, it makes it more clear about what happens under the covers. Next reason: PROC HTTP has been refined considerably in SAS 9.4 to run fast and efficient. Its many options make it a versatile tool for all types of internet interactions, so it's a good technique to learn. You'll find many more uses for it. Before you can write code that parses a web page, it helps to have some idea of how the page is put together. Most web pages are HTML code, and the data that is "locked up" within them are expressed in table tags: <table>, <tr>, <td> and so on. 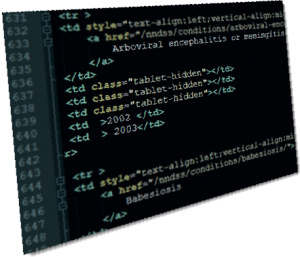 Before writing the first line of code, open the HTML source in your favorite text editor and see what patterns you can find. For this example from the CDC, the data we're looking for is in a table that has 6 fields. 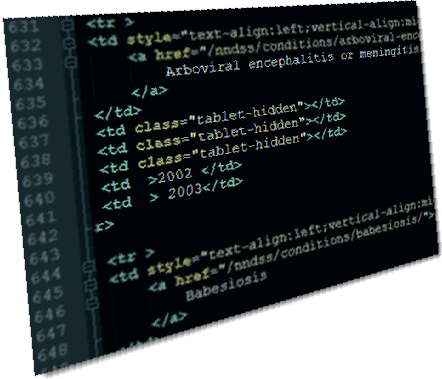 Fortunately for us, the HTML layout is very regular, which means our parsing code won't need to worry about lots of variation and special cases. Reads all of the text lines into a data set and eliminates the blank lines, so we can have a reliable offset calculation later. For this, I used a DATA step with INFILE, using the LENGTH indicator and a simple IF condition to skip the blank lines. Finds each occurrence of the "/nndss/conditions/" token, our cue for the start of a data row we want. I used the FIND function to locate these. If this was a more complex pattern, I would have used PRXMATCH and regular expressions. For this example with the CDC data, we're done. All of the data that we need appears on a single page. However, many web sites use a pagination scheme to break the data across multiple pages. This helps the page load faster in the browser, but it's less convenient for greedy scraping applications that want all of the data at once. For web sites that paginate, we need to repeat the process to fetch and parse each page that we need. Web sites often use URL parameters such as "page=" to indicate which page of results to serve up. Once you know the URL parameter that controls this offset, you can create a SAS macro program that iterates through all of the pages that you want to collect. There are many ways to accomplish this, but I'll share just one here -- and I'll use a special page from the SAS Support Communities (communities.sas.com) as a test. Aside from the macro looping logic, my code uses two tricks that might be new to some readers. The INFILE statement uses a wildcard notation ("*.html") to process all of the HTML files that I collect in that folder. It does not need to know the specific filenames nor how many there are. This allows a single DATA step to read all of the HTML files in one pass. The result of this program is one long data set that contains the results from all of the pages -- that is, all of lines of HTML code from all of the web pages. You can then use a single DATA step to post-process and parse out the data fields that you want to keep. Like magic, right? A way to fetch user reviews from iTunes using SAS -- a good example of scraping "proprietary" data from a provider who is not likely to make this available easily in another way. Using SAS to Help Fight Crime: Scraping and Reporting Inmate Data -- this example may be a bit dated, but you can see the extensive use of PRX* functions to pull data from the web page. If you have access to JMP software from SAS, you could try the File->Internet Open... feature. It's useful for a one-time, ad-hoc parsing step that you can later capture into a JSL script for future use. 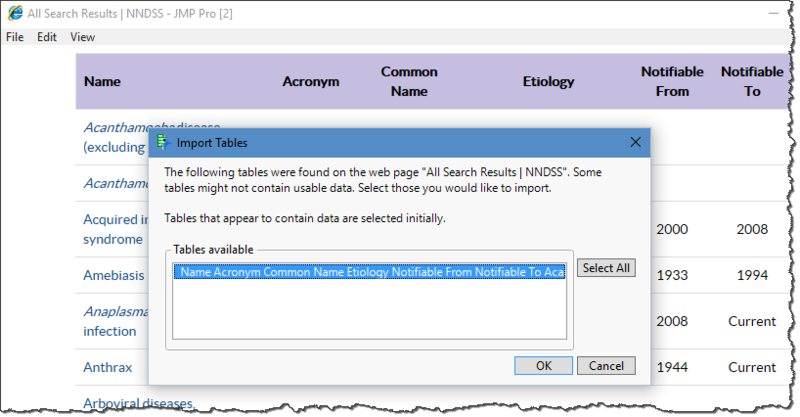 With Internet Open you can specify a URL and select to open it "as HTML," and then JMP will offer a selection of available tables to import as data. This is definitely worth a try if you have JMP on your desktop, as it can lend some insight about the structure of the page you're trying to scrape. I remember way back in the USENET days in the mid-90s, the NFL would post text data files on a very elementary World Wide Web for each game. The files would contain the game scoring summary and team stats, which were perfect for BASE SAS parsing -- especially when you're running a fantasy football league. This was before Yahoo! Sports or ESPN running online fantasy leagues, so all scoring had to be done by hand... except for our league. We would gather all 16 text files -- one file for each game, and combine them with our fantasy team lineups and let SAS do all the scoring in a matter of seconds. i am trying to follow your step but encountering the "connection being refused" issue. May i know if there are any solutions? ERROR: Unable to establish connection to wwwn.cdc.gov. ERROR: Unable to connect to Web server. I suspect that you're trying this from a place that has a proxy/firewall. If so, you'll need to specify the PROXYHOST settings -- your internet gateway -- on the PROC HTTP statement. This is probably already configured for your browser, but programs like SAS will need the value set in the code. if i try your code, it runs fine and shows the expected result. I can't explain the error, but I think you probably want to download a specific listing of Licensed Facilities, right? If so, right-click on the DOWNLOAD button and select Copy Link Address, then paste that into your program. It's a very long link, but here's what I tried. PROC IMPORT did not do a clean job, so you'll probably want to modify and write your own DATA step. But I did get nearly 7000 records.